The boat ride from Labuhanbajo to Rinca island was great and both the kids and my wife and I had the best time. The Flores Sea is a very nice place to go for a boat ride and the views are spectacular. Rinca island, also known as Rincah or Rinja Island is a small island near Komodo Island and faces the larger Flores Island to its right. 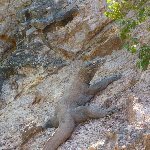 It's probably its proximity to Komodo Island that made Rinca Island a popular place for the large community of komodo dragons that inhabits it. Most people come here to spot the Komodo dragon in its natural habitat and take pictures of this incredible creature. 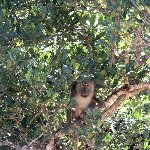 Rinca is a good alternative to spot the animals because it's less touristic than its bigger neighbour, Komodo Island, but you'll be able to have the same wildlife experience. As soon as we hit the shore we could see these giant creatures bathing in the sun and trying to figure out whether the new visitors had brought something to chew on. 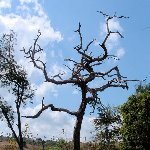 Besides the komodo dragons there's a lot of interesting wildife on Rinca Island which makes it a very popular destination for visitors to Indonesia. From giant lizards to wild pigs and buffalo's you will be able to encounter all kinds of animals here. 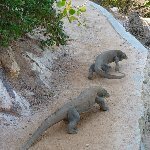 As we arrived at the Rinca Island dock there were these giant komodo dragons walking across the harbor that we had some questions on how to get off the boat! Luckily it turned out they like to mind their own business and everything went fine. It was a very exciting welcome to Rincah island though! We also spotted some monkeys up in the trees and a lot of beautiful birds. We spend the day on Rinca sightseeing and had a private tourguide to show us some of the interesting places. A great day trip and not as crowded as the tours available on Komodo Island. 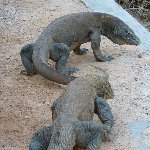 Did you enjoy Komodo dragon habitat on Rinca island and have you been on a holiday in Rinca, Indonesia?